The definition of a midwife varies depending upon where you live in the world. 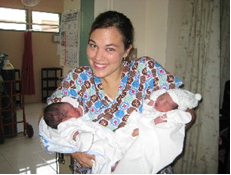 In the United States there are two categories of midwives: nurse-midwives, who are trained in both nursing and midwifery, and direct entry midwives, who are not necessarily nurses before they train to become midwives. Upon graduation from the Midwives College of Utah, a student will obtain a degree in midwifery and be eligible to apply for the national credential of Certified Professional Midwife (CPM). Canadian graduates must complete additional requirements to become a Registerd Midwife (RM) in Canada. “A Certified Professional Midwife (CPM) is a knowledgeable, skilled and professional independent midwifery practitioner who has met the standards for certification set by the North American Registry of Midwives (NARM) and is qualified to provide the Midwives Model of Care. The CPM is the only midwifery credential that requires knowledge about and experience in out-of-hospital settings. Most CPMs own or work in private home or birth center based practices throughout the United States, Canada, and Mexico. Providing continuous care for women throughout their childbearing cycle, CPMs generally carry a relatively low client load (averaging 3-6 births per month) which allows for more personalized and comprehensive care than typical obstetrical practices. The scope of practice of the CPM is derived from the NARM Job Analysis, state laws and regulations, and individual practice guidelines developed by each midwife according to her skills and knowledge. “CNMs are registered nurses with graduate education in midwifery. CNMs provide general women’s health care throughout a woman’s lifespan. These services include general health check-ups and physical exams; pregnancy, birth, and postpartum care; well woman gynecologic care; and treatment of sexually transmitted infections. CNMs are able to prescribe a full range of substances, medications, and treatments, including pain control medications”.